Last weekend, my husband and I decided to start a new Sunday tradition. We agreed to make Sunday the day when we would have the most special breakfast of the week. No more 8 minutes breakfasting, no more cold tartines and no more glass of orange juice on the go. We would have a nice and quiet breakfast full of goodies and giggles and packed with calories. So, I thought that the better way to start this tradition is to make crepes, my all time favorite. When it comes to crepes, my husband and I have different points of view about how we like to eat them. I like chocolate crepes. He likes plain, vanilla crepes. I top my crepes with a little bit of sugar or orange jam. For him it’s definitely Nutella. I roll my crepes like a cigar and dunk them in my bowl of milk. He folds his crepes like a triangle and hates it when I dunk my crepes in my bowl. Basically, we are different but we both enjoy having crepes for breakfast anytime of the day. I tried many, many plain crepes recipes since I was a teenager and this one is by far my favorite. 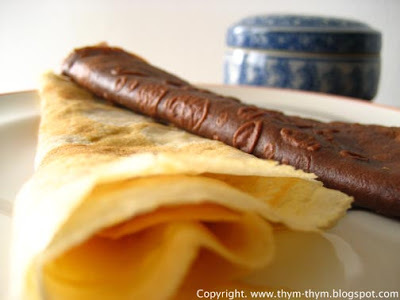 For the chocolate crepe it’s adapted from the book Chocolate desserts by Pierre Hermes. The chocolate batter reminded me of hot chocolate. It was velvety and so dark. I wanted to have a sip of it right away. After cooking my crepes, the taste of cocoa was a little overpowering for me. May be because I forgot to add sugar to the batter. Seriously, I did! Other than that, it was really good and really chocolaty. I think I have to give it another try to make sure that the bitterness of the cocoa was because of me omitting to add the sugar. Well, looks like another day of breakfast bonanza is a must. In a saucepan, heat the milk and the butter just until the butter has melted. Put the flour, the eggs and the sugar in a blender. Blend until combined. Gradually add in the milk and butter mixture. Scrape down sides and blend for 15 sc more. Cover and let sit for at least 2 hours. Heat a pan to medium high. Oil it very lightly. Drop about ¼ cup of crepe batter into the pan and tilt the pan with a circular motion so that the batter coats the pan evenly. You want the layer of crepe to be as thin as possible. Cook each side until golden brown (about 2 min for the first side and one min for the second). Gently remove and place on plate. In a saucepan, heat the milk just until warm. Put the flour, the butter, the eggs, the sugar and the juice in a blender and blend until all combined. Gradually, add the milk. Blend for another 15 sec. Cover the batter and set aside for 1 h.
For the cooking, follow the cooking instructions of the vanilla crepes. Dans une casserole, faites tiedir le lait et le beurre jusqu’a ce que le beurre soit fondu. Retirez du feu. Mettre la farine, le sucre et les oeufs dans un robot menager et mixer le tout. Ajouter doucement le mélange de lait et de beurre jusqu’a ce que tout soit bien incorpore. Couvrir et laisser reposer la pate au moins 2 h.
Faites bien chauffer votre poele a crepes. Graisser avec un peu d’huile. Etalez une petite louche de pate. Laisser bien cuire un cote avant de faire sauter la crepe pour la retourner et faire cuire le second cote. Vous devez obtenir une couleur bien doree et des crepes bien fines. Mettre la farine, les oeufs, le jus, le sucre et le cacao dans un robot menager et mixer. Ajouter doucement le lait tiede. 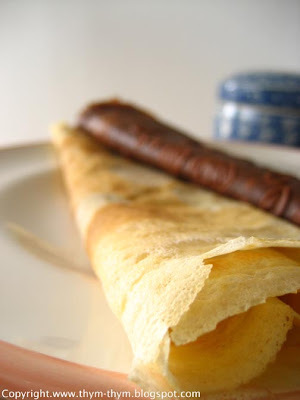 Couvrir et laisser reposer 1 h.
Proceder pour la cuisson selon celle des crepes a la vanille. what a great resolution. i am sure: i sunday cant start any better than with a chocolate crepe! yum. i should do this, too! Bravo pour les crepes et le blog anglo franco. Really great idea are you french? Those looks delicious! I'm working on perfecting my crepe skills and a pierre herme recipe would be just the thing to do it with. Je viens juste de découvrir ton blog grâce à ton commentaire sur "Tartines & Nutella", j'aime beaucoup! I love a warm crepe...with a dollop of nutella. Wait~ is that what $ha said? On fait pareil les dimanches matins avec un beau brunch et plein de calories! tes crepes on l'air super! Moi aussi c'est nature et confiture! hummm ! elles sont l'air délicieuses ces crèpes ! En tout cas tes photos mettent l'eau à la bouche ! good resolution! we try to do like you! I love crepes and haven't made any in years. These are wonderful - I have never had chocolate crepes! - It does Myriam and you should adopt this resolution. - Merci beaucoup Miss bebop. Non je ne suis pas "french" mais francophone. - Thanks Brilynn, you should try it. You can't go wrong with Pierre Hermes chocolate crepes. - It is delicious Sandi. - Helene, c'est tellement bon de se reveiller avec un bon brunch le dimanche. - Merci beaucoup Ganesha pour ton gentil commentaire. - Yes Leonine, I just love this kind of resolutions. - Patricia, it's never too late to have a chocolate crepe. When I'm home next week, crepes are on my must do list. I've not tried them ever and must correct that oversight. You have a lovely blog here. Terrific photos of the crepes! - Thank you very much Lisa. Tell me how it goes. -Thanks for your sweet message mykitchenhalfcups. I am glad you like it. -Contente de te savoir de retour aussi Claude. Bon weekend a toi aussi. It must be very obvious that I am reading through your archives, they are just too good! My family made sunday the special breakfast day too, and we usually had my mother's special savory crepes filled with soft scrambled eggs and veggies or keilbasa sausage (Polish) and rolled, along with a dish of soft cream cheese and a selection of jams. This is one of my favorite childhood memorys! Ask your husband to try Nutella, cream cheese and kiwi slices! It was my favorite street vendor combo when I lived in Japan!